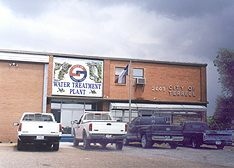 Terrell’s water is supplied by North Texas Municipal Water District (NTMWD). The Water Quality Department is located at 2603 Highway 80 East. Staff monitors the flow and quality of up to 10.0 million gallons of purified water each day. Two water towers with a combined capacity of 2½ million gallons and a 3.0 million gallon ground storage tank provide adequate water supply and water pressure for the city’s residential, industrial, and commercial customers. Water samples are collected and tested monthly from twenty (20) sampling locations throughout the city to monitor water quality. Terrell’s water treatment facility meets or exceeds all federal water quality standards. If you have a question about water quality, contact the water plant at 972-551-6635 or view the Annual Consumer Confidence Report online. The City of Terrell provides water for the Elmo, College Mound, North Kaufman, Lawrence, High Point, and Poetry Water Supply Corporations.